Pistachios are seeds of pistachio tree, and have their origin in the Middle East and Central Asia. Pistachios are generally used as snacks and for food preparations by consumers globally. The seeds can be roasted or raw with seasoning for adding flavor. One of the commonly consumed nuts, pistachios are healthy, good in taste, and offer various health benefits, owing to their high antioxidant and low fat content, which in turn improves the immunity. According to researchers from North Carolina State University’s Plants for Human Health Institute, pistachio hulls represent a rich resource for value-added products, and have potential applications in drug industries and food supplements. The researchers have stated pistachio hulls to comprise a phytochemical composition with a blend of anacardic acid homologues, which are well-known for their anti-inflammatory, antioxidant activities, and pharmacological activities. This further creates potential opportunities for application of pistachio hulls in nutraceuticals. Presence of flavonoids and phenolics in pistachio hulls are higher as compared to several vegetables and fruits considered rich in polyphenols. Prevalence of diseases on the back of unhealthy consumption patterns and ignorance of food safety has surged significantly across the globe. Consumers are now concentrating more on healthy eating habits for preventing health issues including food poisoning, high cholesterol, and obesity. Increasing awareness about presence of toxins in various food products owing to use of pesticides and chemical fertilizers in farming has resulted into a rise in demand for organic food products, may they be vegetables, fruits, or nuts. As pistachios are used in food processing industries, and are consumed as snacks, their organic variety is getting higher in demand. In addition, growing application of pistachios as flavoring agent will also propel their demand in the food & beverage sector. However, contamination by aflatoxin remains a major challenge impeding consumption of pistachios. Fungi produce aflatoxin that affect many tree nuts, and the production occurs at all stages of farming, or harvesting. 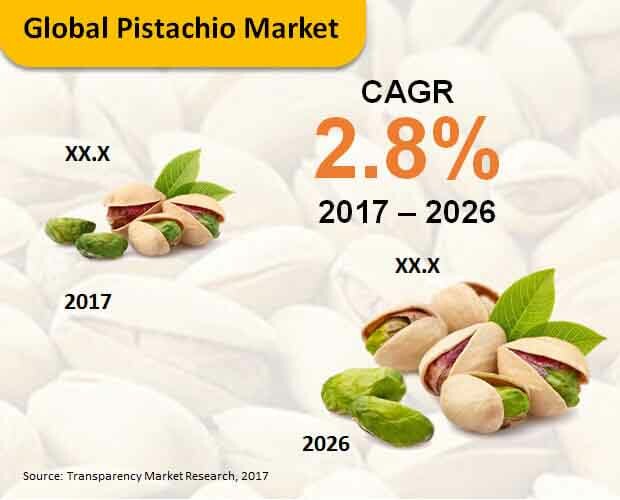 A new research analysis by Transparency Market Research (TMR) states that the global market for pistachios will witness a moderate expansion during the forecast period (2017-2026). Worldwide sales of pistachios are estimated to account for roughly US$ 5,000 Mn revenues by 2026-end. Europe will continue to be the leading contributor to expansion of the global pistachio market, in terms of revenues. In Europe, pistachios are extensively used in bakery products such as cookies, biscuits, cakes, and pastries, for providing them with a distinguished flavor. Sales of pistachios in Europe will surpass US$ 1,500 Mn in revenues by 2026-end. North America and Asia-Pacific excluding Japan (APEJ) are also anticipated to remain remunerative for expansion of the pistachio market, mainly because of wide use of pistachios in food preparations in these regions. Wholesaler/distributor display every variety and brand of pistachio, and deliver multiple options to choose from, which has gained increased interest of consumers. Based on distribution channels, wholesaler/distributor is anticipated to retain its dominance in the global pistachio market, followed by modern trade. Revenues from sales of pistachios in convenience stores will remain sluggish over the forecast period. Key players profiled by TMR’s report, which are actively contributing to expansion of the global pistachio market, include Whistler Foods, Houston Pecan Company, Meridian Growers LLC, Sierra Nut House, Bates Nut Farm, Rasha Pistachio Co., Wonderful Pistachios & Almond Company LLC, Germack Pistachio Company, Setton Pistachio of Terra Bella, Inc., and The Pistachio Co Food Trading LLC. Transparency Market Research (TMR) has compiled a yet another comprehensive and an objective report that provides analysis on the global pistachio market in detail. The report provides a thorough briefing on pistachio market, and involves an exhaustive discussion on recent trends affecting global expansion of the market. Data associated with a variety of parameters is studied in order to arrive at pertinent and accurate numbers related to the global pistachio market. The global pistachio market’s competition landscape has been incorporated in the report, which gives a detailed analysis on proactive companies contributing to the market growth. The report offers a decisive outlook regarding the global pistachio market in terms of historical performance and current scenario. Future prospects of the market have also been delivered by the report in detail, for providing readers with projections and forecasts. The report’s beginning chapter includes the executive summary, which delivers an overall snapshot of global pistachio market for providing imperative information associated with various regional as well as product segments studied within the report’s scope. The executive summary provides the most absolute & relevant market numbers that include the CAGR for historical period, 2012 to 2016, as well as the CAGR for forecast period, 2017 to 2026. Financially rewarding regions have been examined based on largest revenue shares and highest CAGRs in this chapter. Succeeding the executive summary, formal definition of “pistachio” has been delivered, along with an introduction of the market. Moving further, the report has illuminated key market dynamics, including key points such as fiscal stimulus, bottom line of enterprises, and the global economy. In addition, information about the market’s pricing & cost structure analysis has been rendered in the report. Some chapters in this report are focused toward the segmentation analysis of global pistachio market. The pistachio market has been branched basically into four criteria viz. distribution channel, form, end use, and region. Year-on-year growth comparison, and revenue comparision, along with market share comparision are key analytical methods employed to reach at imperative market numbers associated with the market segments. North America, Europe, Asia-Pacific excluding Japan (APEJ), Middle East and Africa (MEA), Latin America, and Japan are key regional segments involved in the report, based on which future prospects of global pistachio market have been delivered. The most valuable chapter of the report, the competition landscape provides intrinsic insights about active companies functioning in the market. In this concluding chapter, the report gives information on novel strategies employed by the companies for gaining lion’s share of the market, and staying at the market’s forefront. SWOT analysis on key participants of the market has been done, along with the essential data such as key developments, product overview, key financials, and company overview. The occupancy of leading market players has been showcased via an intensity map. A tested & foolproof research methodology is used by analysts at TMR to derive revenue estimates regarding the global pistachio market. The secondary research, which is an in-depth & extensive, is carried out to achieve the overall market size, and to determine leading players in the market. Extensive primary interviews with domain experts have been conducted by TMR’s analysts to offer a detailed forecast & analysis on the market, which is delivered in this report. Data gathered from primary and secondary researches are aggregated and validated thoroughly. The data has been inspected using advanced tools to reach at most significant insights on global market for pistachio for the forecast period (2017-2026).